Artist Tomás Saraceno and MIT scientists join forces to confront climate crisis at UN conference. It’s a brisk afternoon in Paris, and sunlight streams through the glass and steel ceiling of the Grand Palais. Once a flagship of the 1900 World’s Fair, this beaux arts palace is now the temporary home of Solutions COP21—one of the largest exhibitions of scientific and educational innovations taking place alongside the UN Climate Conference. Entering through the ornate golden gates into the main gallery, one can’t help but notice two enormous silver spheres. Floating above corporate exhibitors, visitors, and the occasional protestor, they aren’t Christmas decorations, but climate-conscious sculptures from the mind of MIT Visiting Artist Tomás Saraceno. Saraceno is known for interactive sculptures that combine art with engineering, architecture, and natural science to explore sustainable ways of living. This latest exhibition, Aerocene, dares to imagine and define a new epoch beyond our current Anthropocene. Born from an ongoing collaboration between Saraceno, MIT’s Department of Earth, Atmospheric, and Planetary Sciences and Center for Art, Science & Technology (CAST), the project is based on atmospheric physics principles and expanding our ‘thermodynamic imagination,’ Saraceno said. He hopes his sculptures will achieve the longest emission-free journey around the world. Made of silver colored and transparent Mylar, the air-filled sculptures are kept afloat in Earth’s stratosphere by solar heat during the day and infrared radiation at night. Saraceno modeled them after Montgolfière Infrarouge (MIR)—hot-air balloons developed by France’s Centre National d’Études Spatiales (CNES) in the 1970s. He is repurposing the zero-energy ‘aerosolar’ technology to inspire the public and scientists alike. “We like to think of ourselves as living on the Earth’s surface, but we are living at the bottom of an ocean of air. We are told that a shift of 2 degrees will destroy us,” he said, referring to the warming threshold set by world leaders at COP21. “But that feels intangible to us. I think this sculpture visually manifests how much subtle changes can do.” In fact, Saraceno’s assistants monitored the spheres’ pressure throughout the exhibition because solar heat energy coming through the venue’s glass ceiling threatened to overinflate them. Aerocene is more than just a work of environmental art. Ideally, future iterations will float high in the atmosphere while carrying cutting-edge sensors capable of measuring atmospheric ozone, particles, and wind currents, among other things. But a successful flight requires intimate knowledge of large-scale atmospheric dynamics. That’s where MIT Meteorologist Lodovica Illari and her team come in. “Their contribution is taking on the most unpredictable nature of aerosolar balloon flight,” said Leila Kinney, executive director of MIT CAST. Kinney, who collaborated with Saraceno and Illari, was a featured panelist at a Paris symposium that explored Aerocene’s socio-political, civic, and scientific implications. Using historical MIR flight data and associated atmospheric data from CNES, Illari and research associate Bill McKenna examined past trajectories. “Studying the solar balloon flights was very interesting,” said Illari. “We were very impressed by how well the technology was working.” CNES used the MIR balloons to perform several tropical and trans-polar stratospheric flights as late as 2004 with great success. The longest MIR balloon flight, which launched from Bauru, Brazil, in February 2001, traveled around the world in a record 72 days. For example, the best time to launch a balloon traveling from Boston to Paris via the tropospheric jet stream is sometime between January and March, they found. 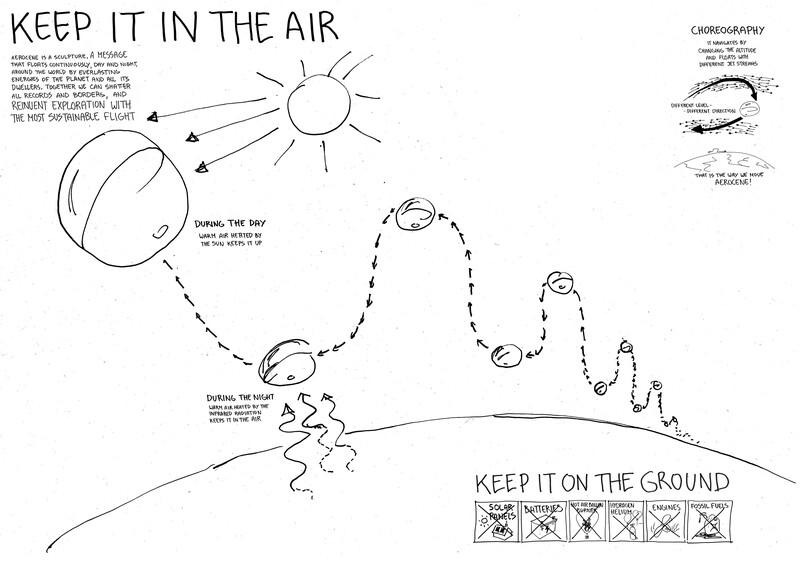 Although the mid- and higher latitudes are not the best locations for aerosolar flight—dense cloud formations in the region’s troposphere shield the balloon from infrared radiation—air flow from west to east is strongest during this period and would transport the balloon in only 24 hours. Comparatively, floating a balloon from Boston to Paris in October, when the jet stream is weaker and not very zonal, could take five days. Traditional air travel has been a boon for mankind, but at a cost to Earth’s atmosphere. Take COP21, for example. Based on the track records of previous conferences, this year’s meeting is all but guaranteed to emit tens of thousands of tons of carbon dioxide into the atmosphere—of which 85 percent can be linked to the air travel of 22,000 delegates, according to the New York Times. And that figure doesn’t account for the travel of approximately 18,000 journalists, activists, and others monitoring the talks. The United Nations says it will offset all carbon emissions from its staff’s travel. As for delegations from the 195 participating countries, offsetting programs are voluntary. During their collaboration, Saraceno, Illari, and McKenna imagined how emission-free air travel might be possible through aerosolar flight. The video below shows tropospheric jet stream trajectories seeded from all world airports in the days leading up to COP21. Each singular path represent 12 hours of travel time, and colors highlight hypothetical balloon launches from the New England area on five departure dates. Although aerosolar flight won't replace jet travel anytime soon, Saraceno and his collaborators around the world are one step closer to its realization. In New Mexico’s White Sands National Monument last November, his team took the world’s first and longest fully solar-powered, lighter-than-air vehicle tether flight. “The visceral feeling of launching Aerocene [at White Sands] felt like skydiving, but away from Earth’s surface,” he said. Eventually, Saraceno will attempt to set the longest human aerosolar flight in Bolivia. Aerocene was also featured in the journal Nature Physics, as well as the architecture and design publication Dezeen. This research was funded in part by the National Science Foundation FESD project.